Trailhead is located on Rt. 123 in Stoddard, NH, 4.7 miles west of Rt. 9 and 3.2 miles east of Rt. 10. Park at the small dirt parking area on the north side of the road. Pitcher Mountain is a very rewarding, but quick and easy trip with a one-way hiking time of about 10-15 minutes. From the parking area, take the trail on the right, next to the forest sign. This is the Monadnock-Sunapee Greenway, which climbs to the summit in 0.4 miles. The trail follows a wide dirt path. After a short climb, it turns a corner and follows the edge of an open field, passing a good viewpoint at the top of the field. It turns a corner again and climbs up a grassy and rocky area to the summit. The trail is fairly steep, but extremely short. 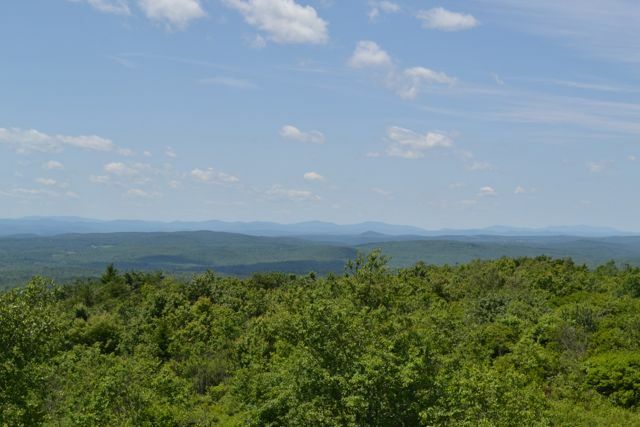 On the summit, there are panoramic views extending into Vermont, which are increased by climbing the fire tower.